Elgin, IL – SGNA Standards of Infection Control in Reprocessing of Flexible Gastrointestinal Endoscopes states: “Drying the endoscope after every reprocessing cycle, both between patient procedures and before storage, is a requisite practice crucial to the prevention of bacterial transmission and nosocomial infections.” “Drying is as important to the prevention of disease transmission and nosocomial infection as cleaning and HLD.” The new Dri-Scope Aid® automates the procedure, freeing technicians for other duties, by delivering a constant flow of HEPA-filtered air through every internal channel of an endoscope. The filter has a 99.97% retention rate of particles that have a size of 0.3 μm or greater. 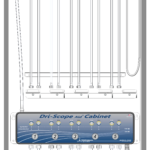 The Dri-Scope Aid® unit features a daily disposable tubing assembly, individual scope connectors and is capable of processing two endoscopes at once. The scopes are simply attached to the tubing assembly via the connectors, the required time is set, and the start button pressed to initiate a continuous flow of HEPA-filtered air through the scope(s) internal channels. Timing can be set between 1 and 99 minutes using the unit’s digital display and touch pad controls. Audible and visible alerts signal when the process is complete. Other alerts warn of low air flow during the procedure and when the HEPA filter needs changing. If a high-pressure event occurs during drying, the unit automatically shuts off. 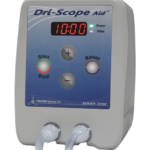 The Dri-Scope Aid® unit is compact (8.2 inches tall by 6.1 inches wide and 6.5 inches deep), weighs only 4.5 pounds and is powered by a universal medical-grade power supply (100-240 V, 50-60 Hz). It is designed for countertop, wall mount or pole mount use. The Dri-Scope system components include the Dri-Scope Aid® unit, one filter assembly, a wall-mount bracket, a universal power supply and an optional pole-mount clamp. 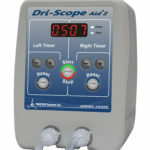 For more information on Dri-Scope Aid®, call 508-423-3223, e-mail sales@driscope.com and visit www.driscope.com. TRICOR’s current quality registrations include: ISO13485:2003, ISO9001:2008, and AS9100.